Corsica’s population of around 325,000 is about the same as Iceland and just a bit less than Malta. The island has its own indigenous language, Corsu, which is more closely related to the Tuscan dialect of Italian than to French and, indeed, Corsica lies far closer to the Italian mainland and the Italian island of Sardinia than to the French mainland. Only around two-thirds of Corsica’s population can speak Corsu, however, and the French language, universally spoken by all Corsicans, has long dominated official matters, education and public life. Traditionally, the Corsican nationalist movement shared more in common with the Basque Country’s Euskadi Ta Askatasuna (ETA) or Northern Ireland’s Irish Republican Army (IRA) than with the political separatists of Scotland or Catalonia. The Fronte di Liberazione Naziunale Corsu (FLNC, National Liberation Front of Corsica), formed in the mid-1970s as a militant force to demand independence, quickly became a leader in western European political violence. Among its most popular attacks were those on chiefly vacant second homes owned by French mainlanders who vacationed along the Corsican coast, also a symbol of France’s disregard for local Corsican culture and autonomy. But the FLNC, over the years, came to behave like an organized crime operation, using its political goals as a racket to demand protection money — or ‘revolutionary taxes’ — from Corsican business owners. Throughout the 1990s, Corsican attacks reached their apex, including the 1998 assassination of the sitting prefect, France’s representative in Corsica, Claude Érignac. 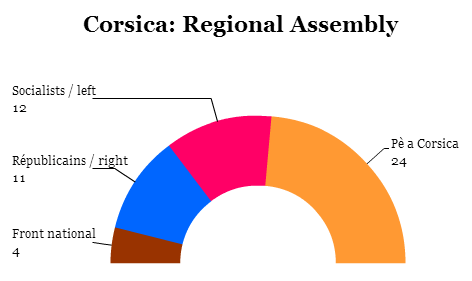 Though Corsica, like all of France’s regions, elects its own regional assembly, the local government’s powers are relatively weak, despite a wave of autonomy granted in the 1980s under leftist president François Mitterrand. In the wake of the 1990s attacks, center-right president Jacques Chirac reluctantly joined forces with his center-left prime minister Lionel Jospin to craft an attempt at broader devolution of regional power to Corsica through the Matignon accords. A series of bungled policies and operations in Corsica, however, helped erode Jospin’s popularity nationally, and Jospin’s own interior minister, Jean-Pierre Chevènement, indignant at responding to political terrorism by handing over ever greater powers, resigned in 2000 over the Matignon accords. After Chirac’s reelection in 2002 (and Jospin’s humiliating first-round defeat), he introduced new propositions for autonomy, though the Corsican electorate narrowly rejected them in a 2003 referendum by a margin of 51% to 49%. Among the reasons for the Corsican ‘no’ vote may have been the government’s heavy-handed arrest of goat-herder Yvan Colonna, Érignac’s assassin, on the day before the plebiscite. At the time, it was a rare setback for Chirac’s new, hard-charging interior minister, Nicolas Sarkozy. In 2014, long after it began a terminal decline in popularity, the FLNC followed the lead of both the IRA and the ETA in declaring a unilateral ceasefire. In the meanwhile, however, political groups had overpowered the FLNC at the center of the Corsican nationalist movement. But infighting among Corsican groups, including the lingering remnants of the FLNC, kept the nationalist cause divided as a political matter. Nevertheless, the disparate elements and ideologies that exist along the spectrum of Corsican nationalism have been gradually consolidating. 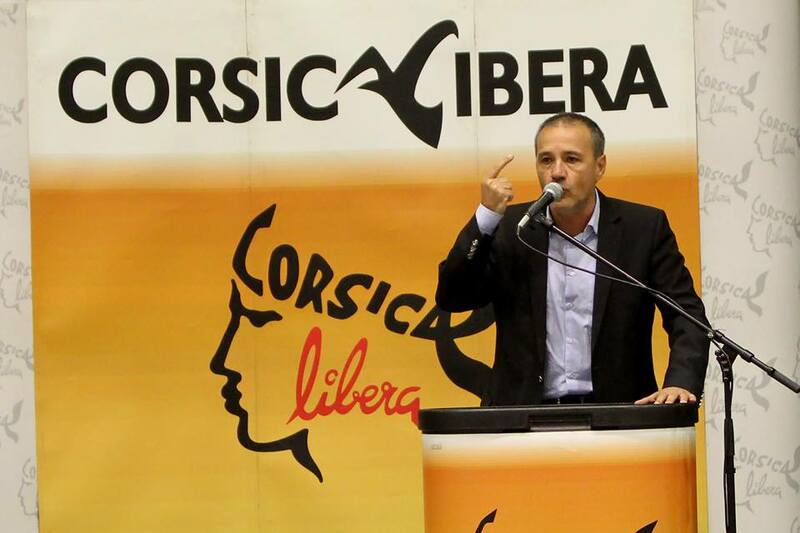 In 2009, three nationalist groups combined to form Corsica Libera (Free Corsica), a hard-left party with the explicit goal of Corsican independence. In the meanwhile, a new party emerged, Femu a Corsica, that prioritized greater regional autonomy over independence. 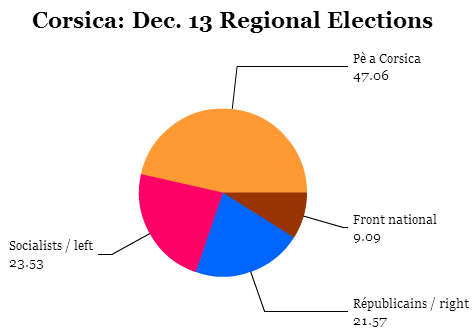 With the cessation of the FLNC’s armed conflict two years ago, the 2015 regional elections were the first set of elections where Corsican nationalism wasn’t defined by violence, radicalism and racketeering. Moreover, the pro-independence Corsica Libera and the autonomist Femu a Corsica joined forces for the 2015 elections in an even broader coalition, Pè a Corsica, which ultimately won 24 of the 51 seats in Corsica’s regional assembly. 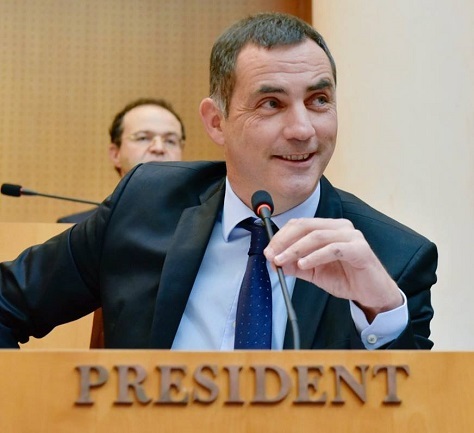 Corsica Libera‘s leader, Jean-Guy Talamoni, is now the leader of the regional assembly, while Femu a Corsica’s leader Gilles Simeoni, the mayor of Bastia, Corsica’s second city, heads the Corsican executive government. Whereas competing leaders of the Corsican nationalist movement once plotted against each other (or worse), Talamoni and Simeoni today hold more power leading a united nationalist government than they ever could have hoped to achieve as the heads of clannish sects. It helped, too, that the left’s standard-bearer, Paul Giacobbi, the outgoing head of the Corsican executive, was indicted for embezzlement in July. The success of Corsica’s nationalists is both a lesson and a warning to Valls and president François Hollande. The rise of a coherent, popular and peaceful nationalist movement in Corsica gives France’s central government an opportunity to make real strides toward autonomy that could tamp down the flames of separatists and, once and for all, end the specter of political violence, to the benefit of Corsicans and mainland French alike. But it also weakens Paris’s iron grip, as a theoretical matter, on France’s regions, and other nationalists, including those in northwestern Bretagne, eastern Alsace or elsewhere in southern France, might soon demand more devolution as well. We in County Nice have long demanded the teaching of Niçard and Italian in our schools due to their historical pre-eminence over French in our region. We have seen somewhat of a renaissance in learning these languages – although their use in official circles is limited. The growth in the advocacy for the teaching of these historical languages in schools and evening colleges serves as a proxy for cultural independence from France, if not full autonomy.